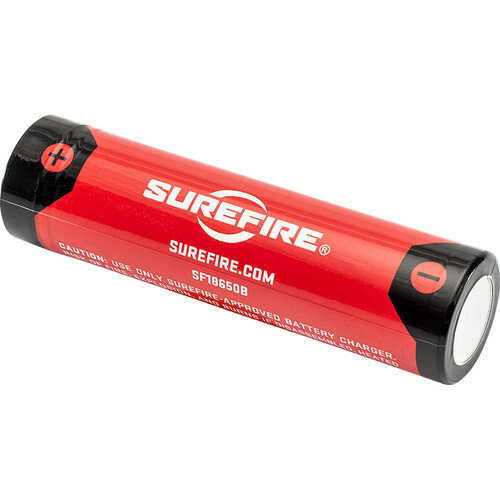 Power small electronics including LED flashlights, lanterns, headlamps, and other compatible devices with the SureFire 18650 Li-Ion Rechargeable Battery. The battery has a built-in micro-USB port, enabling you to charge it from a wall outlet, power strip, or computer using the included USB cable, eliminating the need for an external charger, with an integrated LED charging indicator. But, if you prefer, you can insert the battery into a conventional cradle-type charging base just as you would more standard rechargeable batteries. The battery provides 3.6V of output power with a capacity of 3500mAh, resulting in a 12.6Wh energy consumption rate to power high-drain devices like LED flashlights for up to ten hours. To protect it from damage it comes with overcharge and over-discharge circuitry. Box Dimensions (LxWxH) 19.3 x 4.5 x 3.7"
18650 Li-Ion Rechargeable Battery with Charging Port (3.6V, 3500mAh) is rated 5.0 out of 5 by 2. Rated 5 out of 5 by han from Excellent Great battery, long life and love the built in USB charging capability. B & H was a pleasure to do business with, fast, efficient, and great pricing. Rated 5 out of 5 by Jason from Great battery! Premium brand and not premium on pricing, these are the 2nd generation batteries from SF and capacity up quite a bit. Pricing is not as high compare to others 3xxxmah batteries. I always trust SF batteries. Use them on my LED lights.